I lack the words to introduce today's guest, where to begin? Well I'll try at the beginning. Last year in February when I started my blog, I was humbled and touched by the kindness and honesty of one of the very first commentators. I immediately checked out her blog and that is how I stumbled upon The Plum Bean Project, blog of Priya Parmar "about her adventures in publishing, writing, reading and generally living a plum bean life". I have been a follower ever since, not only because Priya's posts are interesting to read (which of course they are) but also because they are always so full of sunshine and joy of life. Her stories about her daily life in Hawai, her students and the village always bring a smile to my day. So it is with immense happiness that I can announce that Priya's debut novel has been released this month from Simon and Schuster and the reviews are amazing ! I'm so happy for Priya and grateful that she got to share Nell's story with us! 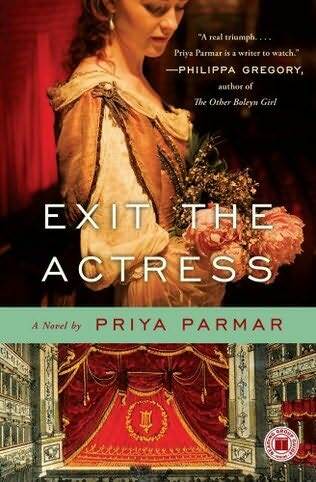 Read on to see how it took a whole village to write Priya's debut novel and be sure to check back in March for an interview with Priya Parmar and my review of Exit the Actress! It really does. The sitting down and getting the words from the fingers to the computer screen is a fairly solitary operation. But the getting the ideas to the fingers and then the computer screen to a book… a village. A big and wonderful village. It is terrible. My friend has a fight with her boyfriend and tells me what she said that she should not have said and off I go filing fragments away to be shaped and dressed and painted and primped and refitted into a scene of the book. I do not even know I am doing it. 99% of me is sitting there listening and 1% just makes off with the conversation, like a sandwich in a purse. Awful. And then there is the encouragement. In Hawaii I stop in to a little coffee place called Java Kai. I do not even drink coffee. Tina and her husband Mark own Java Kai and my friend Tora owns Relish salon next door. Every day they would ask how the writing was going. Tina asks what is going on in the plot. Mark asks how the arc of the story is feeling and Tora asks when she can read it. It helps. It makes you feel part of the world instead of like a mole in hole. I would send my pages to my mother and she would read and comment and make notes and it made me feel like I was not sending the words out into a void but off on a voyage in my computer and there were lots of friends standing on the dock to wish them well. And then there are the blog friends. I started my blog about eighteen months ago (when I was at home with a cracked rib and had just seen Julie and Julia). I had no idea that I would actually make wonderful, wonderful friends. It was the thing no body told me. Real friends, who love books and read with nuanced, practiced, discerning eyes and generous, wise hearts. It was extraordinary. And then there is the publishing world. An agent is a marvellous thing. She fights your corner like a champion and suddenly as a writer, you are not alone in the boat. My publishing house is Touchstone and they took beautiful, sensitive care of this book. When I phoned up very late in the editing stages, my wonderful editor understood that the colour ‘scarlet’ had been repeated and had to change to ‘poppy’. And two weeks ago, when Exit the Actress came out I felt a great moment of shared joy. We did it. Together. None of it would have been as memorable or happy without that sense of community, of shared endeavour. It made what was wonderful, so much better. Priya Parmar, a former freelance editor and dramaturg holds degrees in English Literature and theatre. 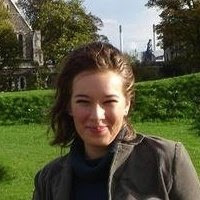 She attended Mount Holyoke College, Oxford University and is currently a doctoral candidate at the University of Edinburgh. Her first historical fiction novel, EXIT THE ACTRESS is being published on February 1, 2011 by Touchstone/Simon and Schuster and she is currently living in London and working on her second, set in WWI. When not researching in the UK, She is at home in Hawaii writing and reading everything and she is always looking for new recommendations! You can visit Priya at her official website or her blog. While selling oranges in the Theatre Royal, Covent Garden, sweet and sprightly Ellen "Nell" Gwyn impresses the theater’s proprietors with a wit and sparkle that belie her youth and poverty. She quickly earns a place in the company, narrowly avoiding the life of prostitution to which her sister has already succumbed. As her roles evolve from supporting to starring, the scope of her life broadens as well. Soon Ellen is dressed in the finest fashions, charming the theatrical, literary, and royal luminaries of Restoration England. Ellen grows up on the stage, experiencing first love and heartbreak and eventually becoming the mistress of Charles II. Despite his reputation as a libertine, Ellen wholly captures his heart—and he hers—but even the most powerful love isn’t enough to stave off the gossip and bitter court politics that accompany a royal romance. Telling the story through a collection of vibrant seventeenth-century voices ranging from Ellen’s diary to playbills, letters, gossip columns, and home remedies, Priya Parmar brings to life the story of an endearing and delightful heroine. You can win your own copy of Exit the Actress by Priya Parmar by commenting below! 2. Leave a comment/question for Priya, or share with us a blogging story or how a community helped you achieve something. Giveaway ends on Friday 4 March 2011.